… The thing about having toddlers is that they need their Mama on a fairly constant basis, which I both love and find annoying at times. But the reality is projects get slowed way down so that I can soothe hurt feelings, calm hysterical tantrums (without throwing any of my own) and kiss boo-boos and fix owies. My daylight ran out and I thought, well that’s why God made flashlights, right? But then, my drill battery ran out of juice. God has a way of telling me when to take a break. But, the good news is, I’ve got all the planks I need, and it’s beginning to come together. So my little footbridge will have to wait until tomorrow for some more progress. In my mind’s eye, it is the crux of the whole structural plan for that area- it will be the foundational point for the arbor, the grape trellises, and the walkway connecting the gardens to the chicken run. Some of you don’t get why this walkway is such a big deal… So I’ll fill you in. My chickens are little compost factories. I put in grass, scratch, and veggie scraps, and they scratch it all up and eat it, turning it into gorgeous composted organic matter. I know what you’re thinking now- chicken manure is a “hot” manure, you can’t put that stuff directly on your garden, it has to compost! But because of the sheer volume of organic matter given to my chickens, the process goes relatively quickly. They manufacture topsoil so quickly in fact, I have to get in the run a couple times a year to shovel it out so I have room to open the gate again. Not to mention all that organic material eliminates any odor whatsoever. You can’t smell my chickens. 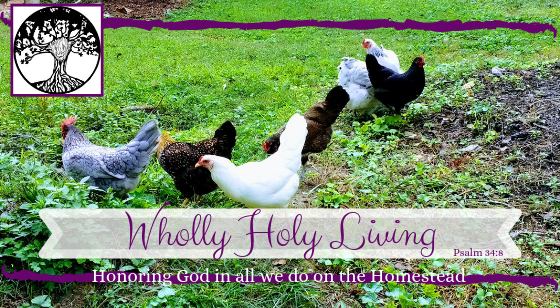 Have you ever been inside a barn or chicken coop where they’re fed exclusively grain? The stench is horrendous. Not so with my birds. And that’s how I like it. So anyway, shoveling the topsoil out of the chicken run and into my B2E gardens will be a whole lot easier when I can take a straight shot from one side of the swale to the other instead of walking all the way around. It seems frivolous or unnecessary, but hey, so are power tools. But power tools sure are more efficient. And we like to work smart, not hard around here.